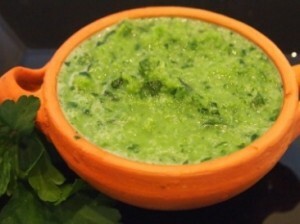 Traditional Ají Verde uses green rocoto peppers which have a simple mild flavor but a heat level similar to a jalapeno. This ají pairs green peppers with a variety of herbs and the resulting hot sauce adds an absolutely delicious and colorful punch to some of Peru’s rich and creamy entrees and starters. Blend peppers, herbs, garlic, and oil in a blender or food processer. Add enough water, 1 teaspoon at a time, to encourage complete liquefaction.